With your design idea modelled on the screen, you will want to make it for real. Making a high quality product or prototype is best achieved through the use of modern computer-based tools and manufacturing techniques. However, we know that the use of CAD/CAM is well established in many schools and colleges, and that is why we have developed Circuit Wizard 3 to sit alongside and complement your existing software and hardware. Be it Techsoft 2D Design, SketchUp, Pro/DESKTOP, SolidWorks, Autodesk Inventor, or whatever your particular favourite software is, you will be able to read in your Circuit Wizard 3 panel designs to progress your product or prototype even further. The same also applies to hardware. By supporting the output of panel cutting paths in the industry-standard DXF format, Circuit Wizard 3 allows you to finish your projects off to a high standard by manufacturing them with your school or college's existing laser cutter or prototyping machines. To see what is possible, why not take a look at our new GENIE Cuddly Creatures and GENIE Rock Star projects. These were both produced using the new Circuit Wizard 3 design and modelling software. With your product or prototype built, you will be ready for the final step, and that is to download the control program onto the GENIE. 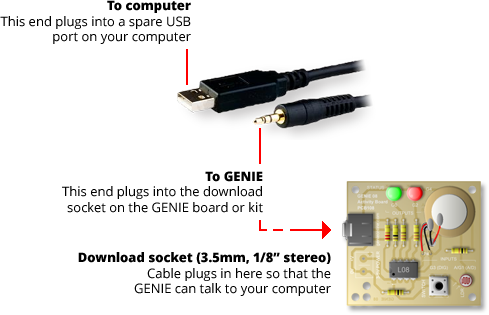 Just connect a GENIE USB Plug & Play cable into both the computer and the GENIE board or kit and select the Run Live option in the software, it's as simple as that! You can download using either Circuit Wizard 3 or the GENIE Programming Editor. Once downloaded, GENIE will remember the program (even if there is no power) until a new program is downloaded. However it is when the GENIE system is turned on that the magic happens. At this point the GENIE will run the flowchart or BASIC program that you have downloaded and begin responding to and controlling the inputs and outputs connected to your embedded system, bringing your project to life! But even at this stage, GENIE is there to assist through a range of testing and debugging options that allow you to see what is happening in your real project. Watch digital inputs and outputs change, check and calibrate your analogue sensors; you can even run your flowchart or BASIC program live on the GENIE, all without affecting what you have downloaded. It's the perfect environment to test new ideas and begin iterating your next design.